Let's start with the car journey. You are ready to drive to a lovely walking location or to your holiday destination, but your dog is not the least bit enthusiastic... Not all dogs like to travel in the car. There may be various reasons for this. 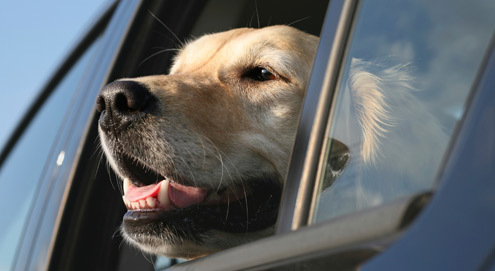 Some dogs find car journeys very exciting or stressful, possibly due to a bad experience. For these dogs, you can use products to reduce fear or anxiety, such as Adaptil (tablets) or Zylkene. Other pets mainly suffer from nausea during the car journey, which can make them anxious. Signals for this include smacking, drooling and possibly vomiting in the car. For these dogs, our aim should be to prevent nausea. Products such as Puur Travel or Beaphar Travel Fit are available for these pets. These products can also be used for air travel. Depending on the country that you are travelling through, there may be different requirements for the way in which your dog is transported. For example, in Germany the dog must be secured with an adjustable seat belt, a travel kennel or behind a dog guard. For some countries there are also different requirements for specific breeds, which are labelled as dangerous by the government. Owners may be required to put a muzzle on their dog in public, and in Spain you even need to apply for a licence for these animals. It is sensible to request information from the LICG (National Information Centre for Companion Animals) or from your veterinarian well before you go on holiday. This means that you will be well prepared! Please note! You should never leave your dog in a car in warm weather, even when the car is parked in the shade! In outside temperatures of 24°C, the temperature inside the car can get up to 34°C within 10 minutes. Leaving a window open will barely result in any airflow in a stationary car, and will therefore provide little to no relief from the heat. Additional cooling products such as those from Aqua Coolkeeper, are not sufficient for protecting your dog from overheating in a hot car! Sun rays (particularly UV rays) can be harmful to dog skin, just as they are to human skin. UV-A and UV-B rays may cause discolouration/burning of the skin. In addition, different types of skin tumours can develop under the influence of these rays, including the infamous melanoma. A dog is mostly well protected by its coat, but this does not always suffice. You will need to apply sun cream to places where the hair is thin (such as the groin and the belly), to scarred and shaved areas (after surgery, for example) and to naked dogs. The SunFREE cream by Dermoscent has been specially developed for this. It is zinc-free and skin-friendly, and also suitable for sensitive skin. Who doesn't love a quick dip to cool down, playing fetch in the water or just having a play? Not all dogs do! Although many dogs love the water, there are also dogs that really can't swim. This may be due to body weight, anatomy or the amount of hair on the dog. Having a play in shallow water or just cooling the paws is an option for these dogs. Don't let your dog swim if you are not sure whether it's safe. There may be dangers in the water itself, such as a current, sharp objects under the surface, blue-green algae or botulism. Before you let your dog into the water, make sure that it can climb back out on its own. If the sides are too steep or too soft, your dog may become stuck. Your dog could get overtired or chilled. If you know that your dog is not a good swimmer or if you take your dog along on a boat trip, it is recommended that you put a life jacket on your dog. There are special life jackets available for dogs, which may save your dog's life in the event that it falls or jumps off the boat. These are the SeaDog life jackets by EzyDog. During the summer holidays, there is often more time for games and relaxation. Aside from all of the walks, boat rides and water play, it can also be fun to play brain training games with your dog. At the point when they really need to use their detection skills, these games can be a fun challenge for most dogs and can really tire them out. You can think of games and scent work yourself, but there are also ready-made games available. One of the best known designers is Nina Ottosson. She developed wooden and plastic games with increasing levels of difficulty. This involves hiding treats in a puzzle. It takes a bit of practice for some dogs, but most will thoroughly enjoy it when they get the hang of it. Tip: don't use the same treats that you normally use. Instead use something that your dog really cannot resist! This makes it even more fun! If you play this game frequently, it may be advisable to reduce the dog's normal food slightly in order to prevent obesity. Are you taking your dog to Southern Europe? Please ensure that they are adequately protected against heartworm mosquitoes, sand flies and ticks. The Scalibor Protector Band offers your dog protection against ticks, heartworm mosquitoes and sandflies. Most importantly, we are looking forward to a lovely summer with plenty of free time to spend with our pets. Hopefully these tips will make it a carefree time too! Enjoy! Helps keep your dog cool in summer. Cooling collar with a chest flap. Helps keep your cat or dog cool in warm weather. Life jacket for safe swimming. Safe and comfortable dog seatbelt. Safe and comfortable car travel for dogs. Universal car rack for added safety during travel.